Was it to the Scouts camp? 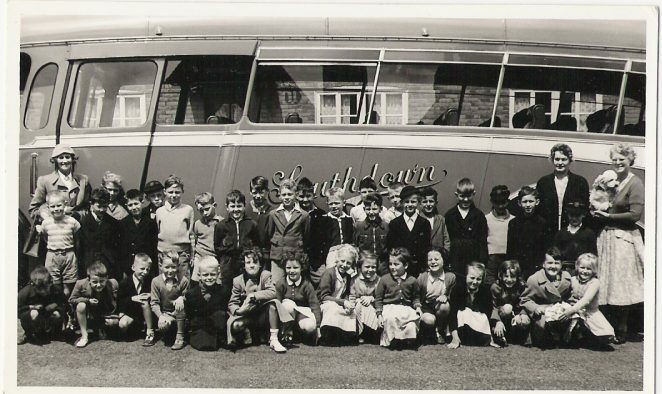 Another Southdown Motor Services coach and another school outing, in 1957 I think. I cannot remember for certain where we went – although I’ve a feeling it might have been to the Scouts camp on the Henfield Road (A281) close to Newtimber. Can you fill in some names? These are the names I can remember, if anyone can fill in any missing names it would be greatly appreciated. If you can help, please leave a comment below. Standing l – r: Derek Gough, ?, ?, ?, ?, Alan Phillips, Richard Mason, Maurice Forrest, Raymond Guy, Robert Shipham, David French, ?, Malcolm Verrall (? half hidden), Arthur Pumfrey, John Baker, ?, Denis Martin, Stephen Williams, ?, ?, ? 7th girl from the left is Joan Sell and 9th from the left is Pam Robinson. I’m standing next to Miss Lewis at the back. I went to St Peters from 1957-9 but can’t see myself on this photo. I remember Miss Lewis, she came to teach at the Knoll, unfortunately she suffered a case of extreme sun stroke and died. Connecting through the years the current Head is a long-term friend of mine.